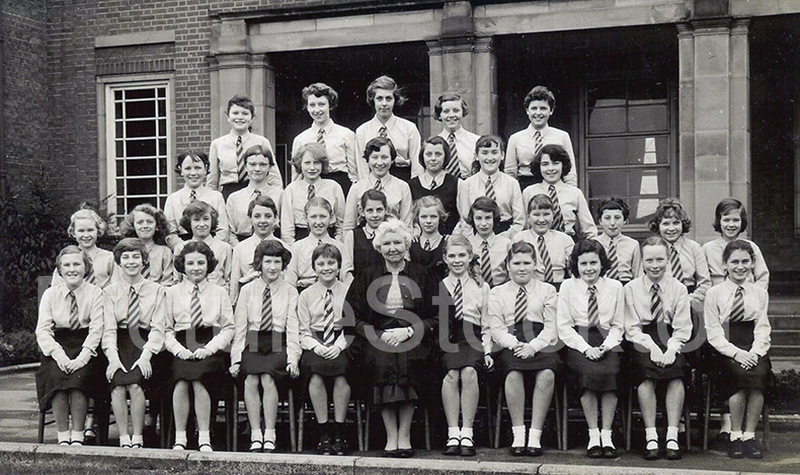 Our first year at Grangefield Grammar school for Girls in 1959/60. Photograph and details courtesy of Patricia Rendall. I am in touch with Pat Armstrong, on the right hand end of the front row, now in Australia, and she would love to hear from anyone in our class. I am happy for my email address to be used as a contact. I was having a bad hair day too! Fourth from left on front row – Pat Lyon. Between Susan Henderson and Susan Maddison. I left Grangefield under awful circumstances, much to my regret, when I was 15. What I do remember, having had four years of excellent and efficient teaching, was how very much I appreciated the place and how much it has stood me in good stead many times in my life, ever since then. A great, marvelous school. Almost new when I was there – unlike the town street where I was from, where nothing at all was even approaching new! Irene Watson thinks that she can spot Sheila Cliff, Christine Jones and Kathleen Watson. Recognise lots of faces and wondering who on earth cut my hair!! Not saying where I am.